Sunday RTL replaced by RT. 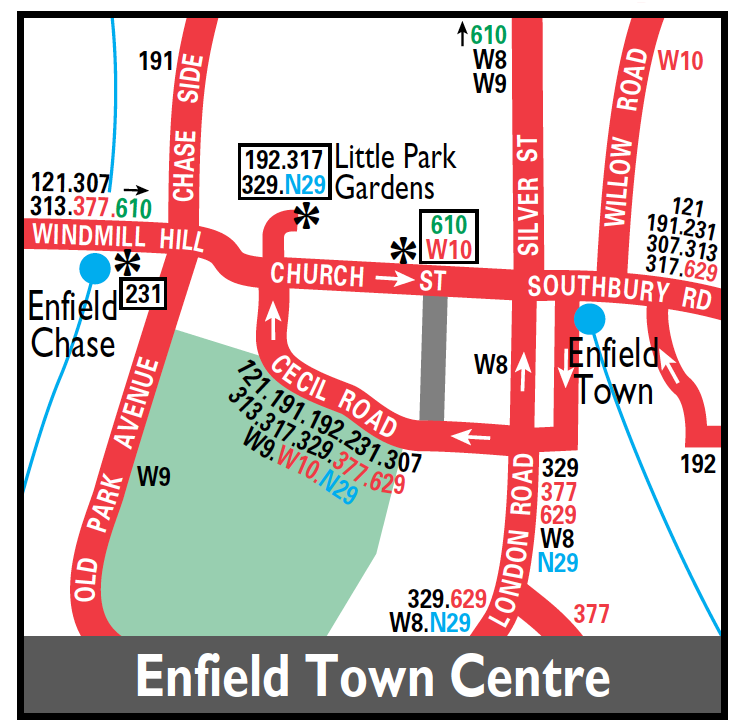 Saturday shopping hours extended from Enfield Garage to Enfield Chase Station. Extended in Chingford to RFH and extended from E garage to Enfield Town but withdrawn between Enfield Town and Enfield Chase. Saturday service converted to OPO as Mon-Fri.
Rerouted at Ponders End to Enfield Lock and revised to run end to end daily. The Ponders End to Chingford section replaced by revised 313. The new section to Enfield Lock replaced withdrawn section of Route 107. Saturday Palmers Green (AD) allocation added. Mon-Fri Palmers Green (AD) allocation withdrawn. Two Mon-Fri schoolday journeys operated by Leaside Travel from Edmonton Garage.